Just as I mention the man in my previous post, (see here), Giambattista’s new collection hits the Paris runways with a stunning array of dresses, complete with billowing tulle layers and bright floral prints. Pastels were paired with clashing shades of red and orange, lattice and lace and snow-like skirts swept down the runway, creating a delicate yet powerful impression to the lucky front row. Feathers, ruffles and high necks were the main themes of this collection, with billowing skirts echoing the form of whip o cream, pin-pointed by Vogue in their overview. If you thought double lace was a fashion faux pas well…your right, it usually is. However, somehow, Giambattista has managed to make it look amazing using contrasting colours and separating the two sections with a open top and baby blue, sequin embellished strip. Textures upon textures have been combined to create a stunning garment which successfully aviods being too overpowering and tacky. The relaxed colour pallet is soft and compliments the fabrics to create a feminine and high-edge garment. This next dress is femminine with a stylish impact which I wish I could wear everyday. The soft tufts of tulle which make up the skirt look so soft and I can imagine sitting down and being surrounded by the soft fabric. 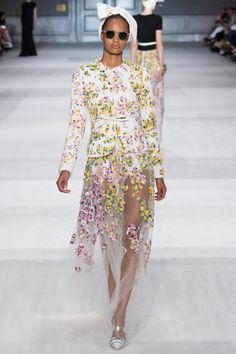 (I’m really tiny so I’d probably be covered by the fabric but I digress…) The monochrome pallet of the dress is a signature look on the runway and merges with the floral jacket, which gives the garment a hint of street style-gone-catwalk edge to it.